United Autosports has spent this month “practicing what it preaches” regarding a side of its business that is not widely known. The UK-based team has competed in the FIA World Endurance Championship, European Le Mans Series and IMSA WeatherTech Sportscar Championship in recent years and will contest the 2018-19 Asian Le Mans Series. But another thriving element to the Anglo-American team that achieved a class podium* in only its second Le Mans 24 Hours and recently achieved its 20th ELMS podium from 26 race starts, is its ground-up restoration service that Richard Dean’s experienced staff can offer to Zak Brown and customers that can then be raced successfully again. Highly-detailed renovations are catered for in-house at its Garforth near Leeds (UK) workshops with the month of August seeing four such projects take to the race tracks again in Europe and North America, the cars having been meticulously and lovingly brought back to life in their original specifications. United’s Co-Owners Zak Brown and Richard Dean shared the driving duties of a 1970 Chevron B16 Cosworth and 1974 Ford “Cologne” Capri RS3100 at the AvD Oldtimer Grand Prix at the Nürburgring while Brown drove a 1988 Audi 200 Trans-Am quattro and 1981 Porsche 935 JLP-3 at Monterey’s Rolex Pre-Reunion and Reunion events in California. At the German event the Capri, that was raced by Niki Lauda, Jochen Mass, Rolf Stommelen and Klaus Ludwig in 1974 and ran for the first time again in the Spa Classic three months ago, recorded two top-five class race results with the Chevron, which won the 1970 Lombank Trophy in the hands of Graham Birrell, posting the second fastest qualifying time in its class. In the two Rolex events staged at the Laguna Seca race track over the past two weekends, the ex- John Paul Sr/Jr. Porsche scored two thirds and two fourths with the Audi achieving two top-10 finishes with Brown at the wheel. United Autosports have proven themselves to be dedicated to sustaining and improving the world of motorsport and vintage cars by carrying out successful restorations on a variety of machinery and none more so than the 1988 Trans-Am Series winning Audi 200 quattro which was racing for the first time at Laguna since it’s full restoration an annual gathering featuring over 500 historic and period-correct race cars from nearly every era so it was truly fitting that the Audi should return to race-action Stateside. The Audi was purchased in March 2016 from a museum in Las Vegas with Paul “Flower” Haigh, a veteran of over 50 years in motorsport, overseeing the rebuild which began later that year. He recalls: “The car has been completely rebuilt, including every single nut and bolt. It went back to bare metal for the re-spray. The engine was sent to the original engine builder, Franz Lehman in Lichtenstein, for a complete rebuild, while the transmission also had a full rebuild. The car is now in as new condition as it was back in ’88. It was a big project and probably lasting a year in total but an absolute pleasure to work on. It’s still a fantastic car, despite its age, and the ‘old girl’ must have been way ahead of her time, just fantastic engineering." 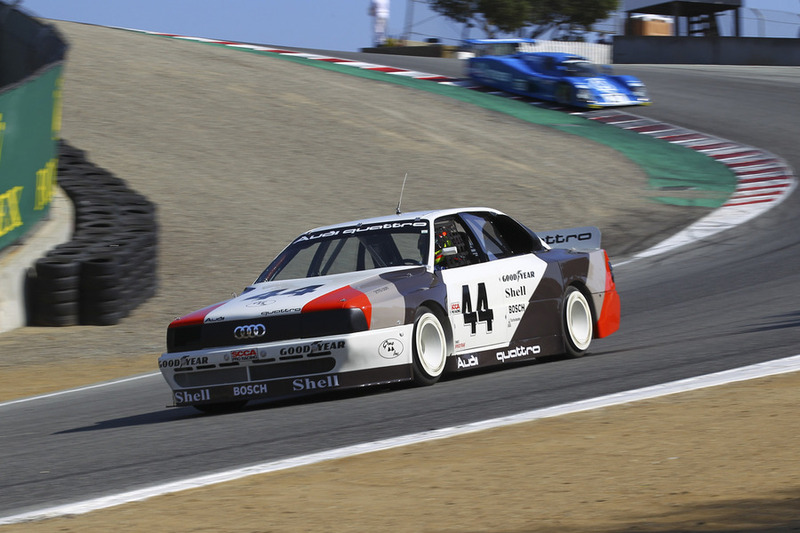 The Audi, which never actually raced at Laguna in 1988 was grouped together with a wide range of machinery for its Monterey races, including Porsches (935 and 962), Chevrolets, Nissans, Mazdas, Pontiacs and Toyotas. Zak added: "The power is awesome and the look of it is brutal. I love it and it was a privilege to give it's race début back in the US at Laguna after United brought the Audi back to life."